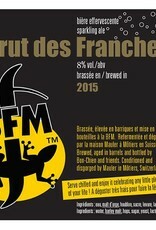 "Brewed, aged in barrels and bottled by Bon-Chien and friends. Conditioned and disgorged by Mauler in Môtiers, Switzerland. A blend of 3 long aged saison √225 (aged in vin jaune, smoked, and classic version), bottled and conditioned like Champagne. and then aged again over 15 months in a Champagne cellar near by. The Champagne like conditioning/ sparkling really brings out new fragrances, it has nothing anymore to do with the basic beer which is 3 years now."